German Wine Books – The wines of Germany can sometimes be confusing with their extremely long varietals (trockenbeerenauslese?) and their cryptic labels. The books below will help anyone become an expert on the wines and vineyards of Germany. Climb the terraces of the Mosel or sail along the Rhine as you discover all German wines have to offer. 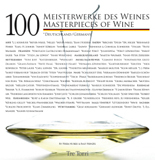 An overview of the 100 best wineries in Germany as seen through their labels. Read our wine book review.